Eating the faeces of other dogs or other animals (called coprophagia) may seem like a necessary part of survival to your dog, even though it is unpleasant to us. Eating non-edible material (called pica), such as stones or plastic, is potentially dangerous and can be fatal. This is quite common, especially amongst young, neutered dogs and particularly in those that have spent some of their early life in kennels or in an area where faeces were abundant. Some dogs only eat the faeces of herbivores (a good source of fibre and relatively harmless – make sure they have a good drink afterwards to wash their mouth out), while others will hunt for cat faeces hidden in the undergrowth, while some may target dog or human (!) faeces. Some may show a preference for warm faeces and other dogs may eat their own just after they have toileted. Although it seems repellent to us, dogs have a reason for doing it and finding that reason is the key to stopping it. Dogs are not repelled by the same scents that we are and sometimes get their noses very close to urine or faeces left by other dogs just to investigate. Given that they have relatively few taste receptors in their mouths and don’t mind the smell, eating faeces may seem quite logical to them. Could it be a medical issue? Always, always have your dog checked out by a veterinary surgeon first before going further. Certain medical conditions can make your dog crave things that are not included in a regular diet, while malabsorbtion or dietary insufficiencies could make him ravenously hungry. Boredom - many dogs that do it are or have been kept alone for long periods of time with limited stimulation. They have nothing else to do, nothing to chew, and so faeces may be the only interesting thing in their environment. Once they have discovered the enjoyment of eating faeces, they go back to it time and again. Learning - once dogs have learned that eating faecies is rewarding, it quickly becomes a habit. Dogs might learn from watching other dogs do it, but if conditions are right, they will learn to do it themselves as it is such a self-rewarding behaviour. 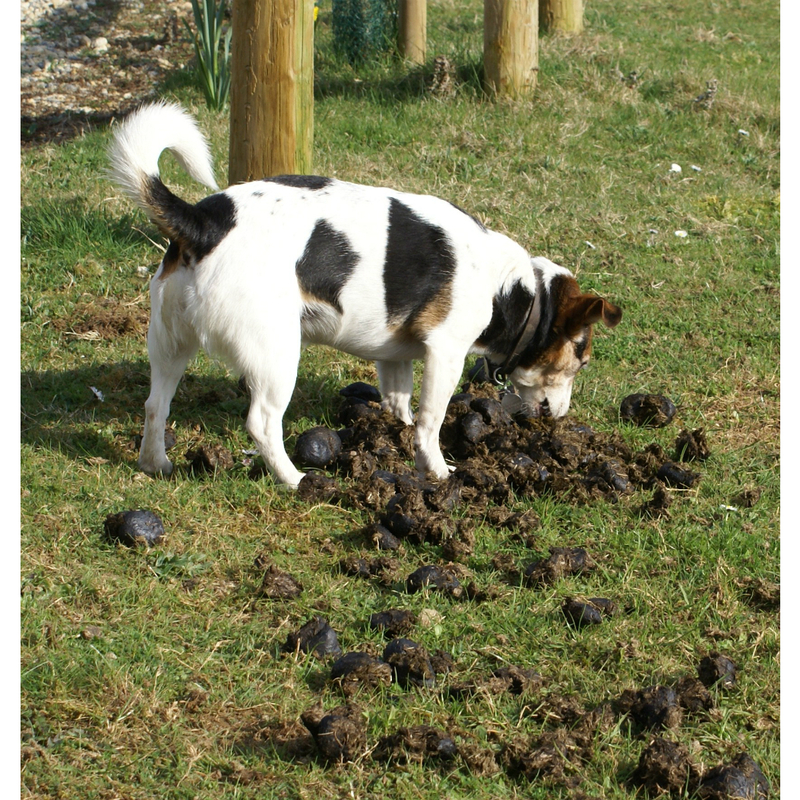 Once your dog has learnt where to find faeces, it is natural to actively look for more, e.g. cat faeces in flower beds, dog faeces on walks. Young dogs - coprophagia often occurs in young dogs and then they grow out of it (but not always). This could be linked to the big appetite of young dogs, it could be the need for certain nutrients, or that young dogs are more exploratory and hence more likely to need to use their mouths. Diet - flavour enhancers in commercially produced dog food can pass through the gut and cause faeces to smell like food once it comes out the other end. Dogs fed on canned food, puppy food and performance food produce more ‘attractive’ faeces than dogs fed on high-fibre, low-quality food. This may be due to the high fat and protein content. Change the diet - consider changing your dog’s diet to ensure he gets all the nutrients he needs. Dogs, just like people, are individuals and a diet that may suit one dog may not suit another. Try a different brand of food, buy a better quality diet, or try a more ‘natural’ diet (e.g. the BARF diet). This will help to ensure that your dog gets all the nutrients he needs, especially adequate digestible protein that is not always sufficient in foods that are cooked at very high temperatures and extruded into pellets. Check with your veterinary surgeon first before making any dietary changes, but remember that the veterinary profession are not always well trained in nutrition. Qualified canine nutritionists are hard to find but may be of some help with this problem. Increase the number of meals given - feeding your dog the same amount of food but splitting it into several meals per day can help to reduce hunger levels and make them feel more full. Increase the number of vegetables too to increase the feeling of fullness (pulverize the veggies in a processor as dogs cannot access the nutrients easily unless the cell walls are broken down). Feed half an hour before going out on a walk to allow the food to move out of the stomach (to reduce the chance of bloat) and to allow the nutrients to enter the blood stream so that your dog is not so hungry when on a walk. Prevent access to faeces - Pick up all faeces in the garden or yard where your dog is kept, and check regularly so faeces can be picked up as soon as your dog does more. Feed your dog at regular times so you know when he is likely to produce faeces and then keep watch. Put cat litter trays out of reach (not of the cat! ), either up high or use a stair gate to prevent access. Until you have found a long-term solution to the problem, you may like to consider muzzling your dog when out walking so he cannot pick up faeces. Make sure it is a big basket muzzle that will allow him to pant and get rid of excess heat easily. Give more stimulation - both physical and mental. Give more walks, and play and attention so that your dog something more exciting to do than hunting for faeces. Give more chances to explore new environments. 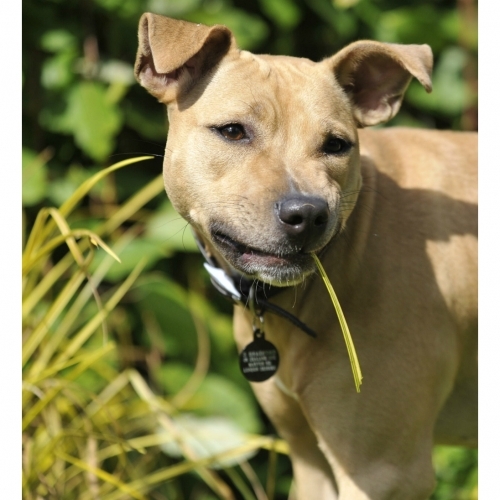 Give your dog more things he can do with his mouth, particularly if he is an adolescent, i.e. chews, dinner in stuffed kongs etc. Take toys out with you on a walk and play often. If your dog is watching and waiting for a toy to be thrown on a walk, he is less likely to be searching for faeces to eat. If dog eats it own faeces, pick up faeces and hose down the garden area well. Then, once it is dry, scatter feed in garden so dog changes its searching pattern to looking for food rather than faeces. Food additives - some dogs may be unable to break down the protein in their food sufficiently and that is why their body is telling them to eat more. If this is the case, adding raw pineapple (not tinned or juice as these have been heat-treated and the enzymes denatured) or monosodium glutamate (a meat tenderizer) to their food and leaving it to soak for half an hour before they consume it may help. Teach an instant recall - keep eye on your dog when you are out and call him back when he starts sniffing. Direct his attention into a game with a toy instead. A long line may be needed at first to make sure he comes to you when you call - go to ‘Instant Recall’. Medical causes need to be ruled out first. Pica can be caused by dietary deficiencies, or medical issues such as oesophageal dysphagia, and these need to be addressed by a veterinary surgeon. Once all veterinary causes are ruled out, changing the diet (as above) may help. A non-veterinary cause of pica is where dogs have learnt to chew non-edible items to get attention from the owner. Alternatively, some dogs will swallow objects to stop the owner from taking them away or if the owner chases the dog and makes a grab for it. Young, inexperienced dogs may also accidentally swallow objects while playing with them. 2. Consider a dietary change if your dog chews and eats non-edible items. 3. Give your dog more attention, stimulation and play with very large appropriate toys that cannot be swallowed. Remove the toys after play so that he cannot chew them and swallow the pieces (see ‘How To Teach Your Dog To Play’ and ‘How To Get The Toy Back After Play’). 4. Give your dog more things to chew that are too big to be swallowed.